Stylish blade holders with a choice of handle. 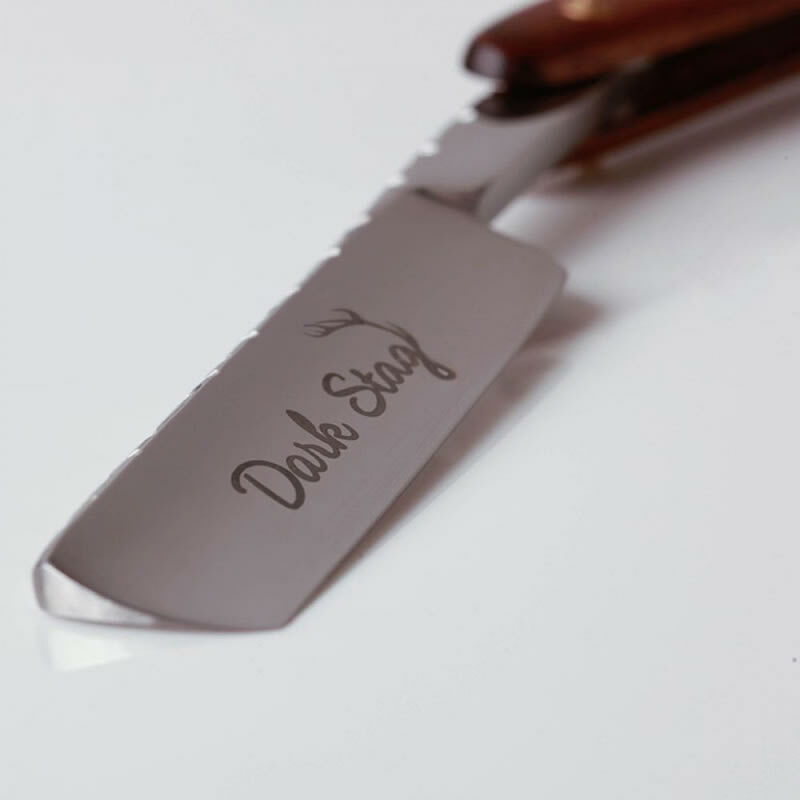 Dark Stag's Straight Razors combine the traditional feel of a folding razor with the convenience of easily-changeable blades. 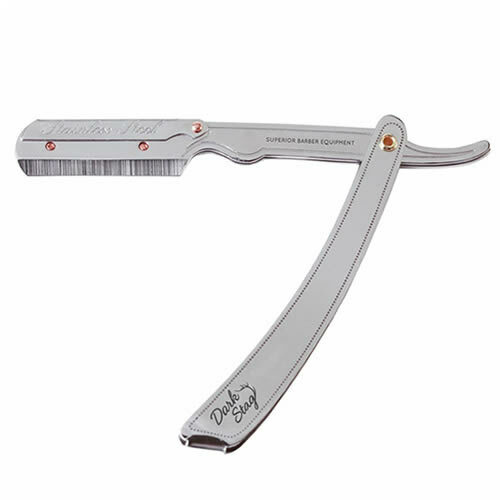 They make short work of shaving, beard-tidying, and shaping facial hair and necklines. Metal is made from stainless steel for a durable, solid feel that offers weight and stability. Wood is made from smooth wood for comfort and lighter feel. 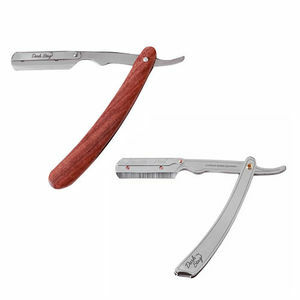 Both razors use half a traditional double-edged razor blade so a single blade can be used for two shaves. £16.14 (inc. VAT) Why no VAT? We're a trade wholesaler and quote our prices without VAT to help our VAT-registered customers understand the true cost of a purchase. Standard fit, double-sided razor blades made from stainless steel and then coated in platinum for smooth shaving and cutting. Packs of 10 or money-saving packs of 100. Standard size, double-sided razor blades made from stainless steel and coated with platinum for smooth shaving and excellent performance. Lightly-fragranced and soothing talc to apply to sensitive skin after shaving. Comes in a 255-g bottle. Standard size, double-sided razor blades. Made from stainless steel. Packs of 10 or great value packs of 200 (20 packs of 10). Pack of 10, double-edged razor blades designed to work with both The Bluebeards Revenge Scimitar Razor and their Shavette Cut Throat Razor. Pack of 10 good quality double-edged razor blades. 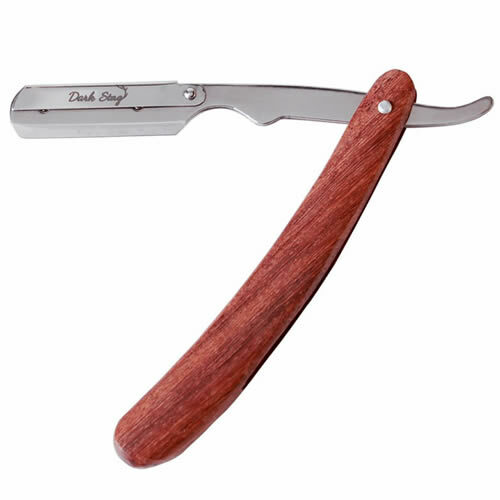 Suitable for use with all razors that take double-edged blades. Orange, rubber razor wiper designed to make it easy to remove excess shaving soap from a straight or cut throat razor when wet shaving.